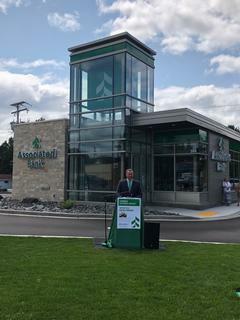 Associated Bank dedicated the new Rhinelander facility on July 27th during a Grand Opening and Ribbon Cutting in celebration of the new location at the corner of Lincoln Street and Oneida Avenue. The new bank increases efficiency and features Associated's updated brand architecture complete with a full service teller lobby and drive-through banking. The Boson Company is proud to have provided our Collaborative Construction Services for another Associated Bank facility.